Shattered Globe’s Satellite Series presents a lineup of staged readings of new and seasonal works featuring both emerging and established artists. Karen the cowgirl and Annie the time-traveling horse follow Suzanne—the love of Karen’s life—to 1822. Lyft driver K and passenger S navigate Chicago streets and awkward small talk. College besties Karen and Suzanne slowly close the gap of time and distance through pivotal moments in their lives. Three whimsical, poignant stories featuring female relationships at differing stages that explore the distance between two people, what connection really means, and the moments where you finally see what is in front of you. 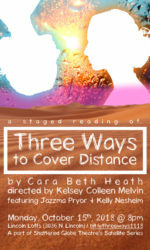 Please join us on Monday, October 15th for a staged reading of Chicago-based playwright Cara Beth Heath’s new play THREE WAYS TO COVER DISTANCE, directed by SGT Ensemble Member Kelsey Colleen Melvin. The two-woman cast features Kelly Nesheim and SGT Protégé Alumni Jazzma Pryor. With Chris Vanderark serving as dramaturg. Doors open at 7:30pm. Performance begins at 8pm. Featuring SGT Ensemble Members Rebecca Jordan, Ben Werling, with Zach Bloomfield, Byron Coolie, and Tim Newell. Like their counterparts in the Roman Empire, our cultural elite have created enough “Bread and Circus” to blind us from the damage done to our solders fighting invisible wars around the world where their hearts and minds are shattered and destroyed. Remember Me shines a light on the nightmare of PTSD and denial plaguing our country. JAKE, a Nigerian Iraqi War Vet suffering from PTSD re-enters his former theater instructor Earl’s tightly controlled and protective world. Jake is forced to face the ghosts – real or imagined – that haunt him and keep him frozen in time. However through love, art and The Ghost of Shakespeare, Earl begins to deal with the unbearable grief that shattered his heart and accept a new life with his fiancé, Mary. Featuring SGT Ensemble Member Ben Werling, with SGT Artistic Associates Darren Jones and Nate Santana. On the hunt for dinner, 3 homeless people find a tattered copy of a “classic” in an overflowing park garbage can. While they forage, eat and settle in the for the evening, they begin to read it aloud and it affects them in odd and surprising ways. Chicago Playwright Stuart Flack is the author of Homeland Security, Sidney Bechet Killed A Man, and Jonathan Wild, among others, and has recently collaborated with The Seldoms on their two recent productions: Power Is Where Power Goes and RockCitizen. Featuring SGT Ensemble Members Rebecca Jordan, Angie Shriner, Kevin Viol, & Ben Werling. Lorne enlists the assistance of a call girl, Julip, to perform a series of fetish acts he hopes will finally free him of his dark compulsions and rescue his failed marriage. When one of the acts takes a deadly turn, Lorne must convince Julip to help him complete his list and find his way out of the strange purgatory in which he is now confined. David Dastmalchian is an ensemble member of Shattered Globe Theatre. Past productions with SGT include ‘Buried Child’, ‘The Glass Menagerie’ and ‘Suddenly, Last Summer’. He wrote the screenplay for the feature film, ‘Animals’, which was recently recently released by Oscilloscope Labs, is on Showtime Networks and won prizes at SXSW Film Festival, Midwest Independent Film Festival, New Hampshire Film Festival, Chicago Film Critics and more. Featuring SGT Ensemble Members John Harrell, Kelsey Melvin, Linda Reiter, Andrew Schad, Megan Skord, & Kevin Viol, with SGT Protégé Alum Joe Liolos and Tim Newell. This classic comedy about love-hate relationships has charmed audiences in many forms providing the inspiration for beloved Hollywood films “The Shop Around the Corner” (1940) starring Jimmy Stewart and Margaret, ” In the Good Old Summertime” (1949) with Judy Garland, and more recently in the 1998 update “You’ve Got Mail” featuring Tom Hanks and Meg Ryan. Set days before Christmas in Budapest, 1937, work place quarrels quickly turn to budding romance after store clerks George Horvath and Amalia Balash discover they are secret pen pals. Join Shattered Globe Theatre at the historic Newberry Library to experience this sweet holiday romance. Featuring SGT Ensemble Members Christina Gorman & Andrew Schad, with Bryan Bosque, Elana Elyce, & Alexander Lane. Domestic drone operator Boyd should be doing well: he has a loving wife, a supportive business partner, and a clean bill of health after a bout with cancer. Instead, he’s so acutely desperate to escape his body that he turns to a mad scientist for help in this dark comedy about the mind-body problem.